Time to get planting, er… planning! While USDA just released the 2018 Farm to School Grant awardees, now is a great time to start thinking about a grant application for next year. Do I sound like a crazy person to suggest that? Maybe. Do I sound like a crazy person and have also helped write two USDA Farm to School Grants that were awarded? Definitely! First, think about your timeline. The USDA Farm to School Grant application is released in the fall, typically around the beginning of October. Once the application is posted it’s open for 60 days before applications are due. This sounds like a lot of time but it can really fly by if you need to get meetings together with involved stakeholders, school business office or fiscal staff and to allow for plenty of time for distributing drafts for proofreading or outside approvals if needed. Second, review the types of activities that are typically funded. You can view a list of previous awards and grant reports here. This will give you a good idea of what types of activities are typically funded. You’ll find it’s a pretty wide range but you want to be sure the activities you are looking at to include in the grant are 1) allowable expenses and 2) inline with the types of activities that are funded. Even if you have the greatest idea in the world, if it’s not an allowable item it will not get funded. Next, think about what kinds of information you can start gathering now and if possible, start to discuss the grant with your leadership and key grant partners. If you can start the discussion of what types of activities to pursue and what kind of costs will go along with that, you’ll be well positioned to have a stellar application ready to go well before the deadline. In general, the USDA Farm to School website is a great starting point for resources. I’m also happy to answer any questions based on my experience, just leave me a comment below! 2018 USDA Farm to School Grantees Announced! Farm to school is just about the greatest thing ever–it brings fresh, local foods in the school cafeteria, opens up new markets to local and oftentimes smaller farmers and supports school gardens. But it doesn’t happen by virtue of a magical farm to school fairy. It takes grit, a positive attitude about changing the way kids think about food and it also takes green stuff (money!). One of the biggest funders of Farm to School efforts is USDA, through their Farm to School grant program. These grants have made some really amazing projects possible and resulted in some outstanding resources being developed that have broad applicability for a whole range of topics from procurement to how to keep school gardens going over the summer. Late last week USDA announced this year’s winners, which include these amazing projects, among many others! 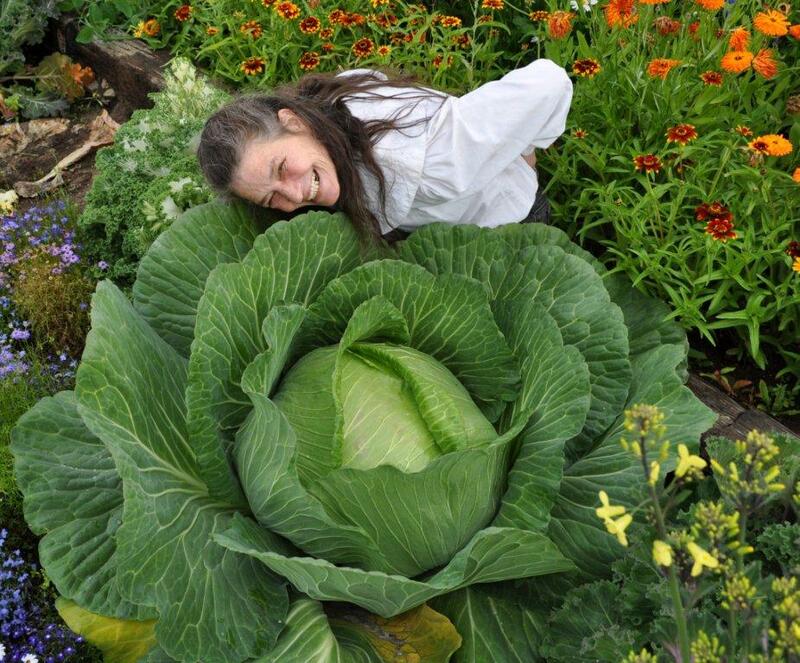 A super big (cabbage growing in the Alaska summer supersized) congrats to all the awardees. Below are some highlights, just to show a small slice of the amazing work being funded. Detroit Public Schools Community District (DPSCD) will provide farm to school activities that support the development of healthy eating habits for DPSCD children by creating a healthy food culture at the district and individual school levels. The project will work towards this goal by strengthening two farm to school activities, the Detroit School Garden Collaborative and Integrating Culinary Arts Students in School Lunch Processing. ‘Aina Pono, Hawai’i State Department of Education’s (HIDOE) farm to school pilot initiative, will bring more healthy, nutritious, fresh, and local food to school cafeterias in Hawai’i. HIDOE cafeteria staff will be trained to prepare locally sourced, scratch-cooked meals and local farmers, ranchers, and distributors will be trained on how to contract with HIDOE. This project will develop the collaborative networks required to execute a statewide farm to school initiative. The Montana Department of Agriculture will increase the procurement and distribution of local food in K-12 schools in Montana. The Montana Farm to Leadership Team has identified three geographically significant schools that are in the early stages of implementing farm to school but have limited access to local foods. By coordinating with state-level farm to school partners, including supply-chain stakeholders, and bringing together local community teams in each of the target school communities, this project will create a plan that will impact the entire State. What was your child’s first word? Often the response is “momma”, “dadda” or “ball”. Maybe something exotic like “kitty” for those with a feline friend in the household. But what’s the first word typically used at the dinner table? “No!”, usually uttered by a preschooler that has just learned the power of that word. Mealtimes can be stressful (especially for parents of preschoolers), and that stress usually centers around a parent trying to coax a child into doing something they don’t want to–ie eating something they don’t want to, stop playing with their food or to sit still during a meal. Does this sound familiar? Did you have an infant that was a willing and easy eater, then a toddler that would try new foods and eat vegetables, then a preschooler that just says “no” to everything but bread and milk? To break this behavior down a bit, let’s look at some of the developmental changes going on in a preschooler. First, they are starting to get a little taste of independence, they are getting a little bit of space from parents and they are also learning novel words—specifically the word “no”. They often want to test those out in combination and using the word no in combination with finding some newfound independence is often exercised at the dinner table. It’s also worth noting that preschoolers don’t often get a lot of opportunities to have control over things and saying “no” at the dinner table is a place where they have can that control. Does this mean a preschooler is a demon hell bent on making everyone’s dinner time miserable? Absolutely not. These behaviors present a fantastic opportunity to support healthy eating behaviors from an early age. Children actually do an amazing job self-regulating food intake, as maddening as it can be observe, and letting preschoolers have some decision making authority over their food intake is a critical first step towards a lifelong healthy relationship with food. First, you may need to re-examine your own expectations around your child’s eating behaviors. The infant/toddler days of spooning food into the “hungry baby bird” mouth have past and are now replaced with a preschooler eager to make some decisions for themselves. I’ve often heard a saying that “kids will eat one meal, play with one meal and ignore the third all together”. I’ve found this to be a pretty sound explanation of preschool eating behaviors. It is also very common for preschoolers to go through what’s called a “food jag”, when kids want to eat the exact same thing for weeks on end. It’s also not uncommon for there to be natural fluctuations in appetite. It’s okay for kids to have variations in the amount of food they eat. Set a good example. While they are exploring boundaries and new experiences, they also mimic what they see. Do you scarf something down while hovering over the kitchen sink or eat while milling about the kitchen? Sit down at the table with your family and use some utensils. Let the mimicry commence. Plan meals ahead of time, and shop accordingly. When planning meals, include at least one thing you know will be a readily accepted option. This could be a starchy component like bread or potatoes, and then rounded out with other options like protein rich foods or vegetables. Avoid a state of “hangry” in both the meal preparer and the meal participants by spending time at least once a week to plan for meals and conduct the grocery shopping to support those meals. Let kids serve themselves when developmentally appropriate and with positive coaching. It can take up to 15 times for child to see a food before they will accept it, so start that positive exposure and be patient until confidence with new foods develop. STAY POSITIVE, but not pushy. You will want to make your kid eat their vegetables. Recognize the urge then just let it go. “Would you like to try some______?”. Honor a no thank you. No short order cookery. It’s the caregivers responsibility to get a balanced meal on the table. It’s the child’s responsibility to make food choices once they are developmentally able. Giving kids a choice over options to include in the meal is also good, “should we have broccoli or carrots?”, but steer clear of “what do you want for dinner?” for younger kids. It’s too open ended and will likely yield a choice you don’t endorse. Involve kids in food preparation. It’s takes time. It makes a mess. But kids who have some ownership are more likely to eat the foods offered. You can start with easy stuff like basic mixing and stirring things that aren’t hot, tearing up things like lettuce leaves or simple tasks like putting toppings on a pizza. You can get “safety” kitchen equipment like knives, I’ve also had success giving kids small paring knives and just supervising closely. Be patient. Easier said then done, right? Seriously though, kids do a great job of regulating their own calorie intake. As adults, we push them to override that internal regulator by forcing them to eat when they aren’t hungry and using meal times to reinforce a power dynamic. Take a deep breath, do some positive coaching and just let it be. Do you have challenges at meal times? Tell me about them and let’s see what we can do to improve the situation! How many times have you heard that phrase about food voiced by a child? Almost always followed with “but have you tried it?” from an adult. How do these food dislikes get shaped and how can we get kids to be more open to trying new foods? First, if I had an easy answer to this question I wouldn’t need a job because I would be busy speaking about that easy answer to parents all across the globe! As a Dietitian this is the single most common question I get from any parent and I have many parents tell me that feeding their kid is the single most stressful part of being a parent. It plagues parents of all backgrounds and demographics. And it’s a bit of a complicated one to answer. There are a lot of factors involved and a lot of variability between children. As a starting point, let’s cover a basic understanding of some physiology and the role it plays in food choice. Some of our food preference may start in utero, according to this article. Some taste preferences and aversions (e.g. liking for sweet, salty and umami; disliking for bitter) are innately organized, although early experiences can modify their expression. In utero events may impact on later taste and flavor preferences and modulate intake of nutrients. Both before and after birth, humans are exposed to a bewildering variety of flavors that influence subsequent liking and choice. Fetuses are exposed to flavors in amniotic fluid modulating preferences later in life and flavor learning continues after birth. Experience with flavors that are bitter, sour or have umami characteristics, as well as volatile flavors such as carrot and garlic, occurs through flavorings in breast milk, infant formula and early foods. The physiology of the tongue also has an impact on food choice. The human tongue is a muscle and serves a lot of functions, one of which is to help move food around your mouth while you chew. While it’s so innate we don’t really notice as an adult, your tongue plays and important role in chewing. Certain foods, like salad greens take quite a bit of effort on the part of your tongue to get chewed up adequately. Think about eating a grilled steak or grilled chicken. While delicious, you really have to use your jaw muscles to get it chewed adequately. For kids that are still developing muscle strength in these areas, some foods can be hard chew and may be avoided because of that. What does this mean for parents? Well, there’s not much we can do about the in utero part! But, as far as tastebuds and chewing muscle strength goes, it may help to be mindful of serving foods that match up with your child’s chewing capabilities. For preschoolers, this may mean serving grounds meats, or meats that have been cooked using a longer, moist cooking method like a crock pot. Vegetables that are light steamed may be easier to chew than raw vegetables but will still retain their color and bit of crispness. Even tossing veggies like broccoli and carrots into boiling water for a few minutes can help soften them just a bit while still staying brightly colored and limit the off smells of vegetables that are well cooked. Up next, the human behavior side of eating! What happens when the word “no” gets discovered by your preschooler and brought to the dinner table……. Summer meals play such an important role in feeding kids while school is out, but it can present some challenges in figuring out ways to attract kids to a location serving meals. While one would think a free lunch we attract a huge crowd, there can be a lot of barriers. With parents working it can be challenge to transport kids to locations serving meals, there may be safety concerns if kids are home with a baby sitter or older sibling and some older kids may be busy working summer jobs. While kids might be busy, that doesn’t mean they aren’t going hungry. Knowing where your next meal is coming from is a struggle for many kids who rely on school meals during the school year and are without that access to healthy meals when school is out. Having access to meals in a safe, secure location can be the difference between going hungry and having enough food to eat. One exciting way to not only attract kids to a safe, secure site, but to also tackle the potential reading skills lost during the summer is through “lunch at the library” programs. This amazing partnership matches up a summer food service program with local libraries. Nutritious meals are served to kids while literacy programs are being conducted, like story time or other education activities. As a voracious reader during childhood, this type of a program combing reading and a healthy, yummy lunch would have a been hugely attractive! The Libraries in Kings County, Washington are also getting into the action! They have a great line up of activities posted here and are also giving away a free book to kids who come and get a summer meal. Bonus: libraries almost always have the AC on so it can be a nice way to get out of the heat! Beside the cooler temperatures of an air-conditioned library, lunch at the library also decreases the stigma of getting food assistance. Getting a meal at a site that allows all kids under 18 to eat a free meal meal with no questions asked about income and no forms to fill out can really decrease the negative perception of a free meal. It also doesn’t have the stigma of waiting in line at a food bank or food pantry. And if kids are getting their tummies and their head fed with healthy stuff, what could be better than that? Will the new tariffs affect my food budget? But I just finished all my food bids! I know the new procurement rules have really made everyone take a closer look at their procurement strategies (including maybe even moving that food bid up earlier in the year! ), but summer is still the primary time for food bids. And while I love talking procurement alphabet soup, (IFB vs RFP!) it’s a complicated topic that can be full of headaches. Now to add to the regular complications, the new tariffs on steel and aluminum may make things even more complicated. How will the tariffs on steel and aluminum affect food prices? While seemingly unrelated, the new tariffs placed on steel and aluminum will likely carry over into packaged foods that use those materials. Currently, most canned food uses a “tin” can, that is actually made up of steel and aluminum, while most canned beverages are made with just aluminum. With an increase in the cost of material packaging comes an increased cost to the consumer, which may mean higher canned food and beverage prices. Depending on the food item, for many packaged foods the cost of the packaging is more than the actual cost of the food item itself. This is especially true of foods with very low cost ingredients like soda and other canned beverages. And with a dramatic tariff added onto the costliest portion of a product, we could see a real spike in some canned food and beverage prices. So what does this mean for school food budgets? It depends on your procurement practices. If your food purchases are small enough to do an informal bid you may want to identify alternatives for items that are likely to see an increase like canned fruits and vegetables and any canned beverages you buy like fruit juice or carbonated low calorie drinks. Keep in mind that DoD Fresh can be a good option for getting fresh fruits and vegetables if it’s available in your area, especially if you typically don’t use all your entitlement dollars. DoD Fresh can be a great source of salad bar ingredients! If you follow a formal bidding process, you’ll need to take a look at your contract terms and conditions. Some contracts include language on how certain conditions would allow for a price adjustment, so you’ll want to take a good look at that if your contracted supplier wants to negotiate pricing as a result of higher costs for canned items. If you don’t understand the contract language, many school districts now have legal counsel who can help you navigate that complicated terminology and help you understand what your contract does and does not allow for. As for USDA Food canned fruits and vegetables, those prices mostly fluctuate based on market prices with some limitations so your commodity dollars may not go quite as far with those items as they used to. Remember when we had all those price fluctuations as a result of drought in 2012 and the affect of increased oil prices on food in 2008? It could be similar to those situations. Any produce you buy from out of the country (in compliance with the Buy American Provision of course) may also been impacted if it comes from Canada or Mexico. I know a lot of fresh produce is a struggle to fit in most food budgets but things like tomatoes purchased out of season often come from Mexico and may come with a higher price in the future. As of right now, retaliation tariffs from Canada and Mexico are just being talked about and we don’t know the details yet so it’s hard to say, but this may be something to stay aware of when we get closer to the colder months. As a big ‘ole procurement nerd feel free to leave any procurement questions you have in the comments section below!